West Metro Mommy Reads: Book to Movie: "The Great Gatsby"
Book to Movie: "The Great Gatsby"
I really battled myself as to whether or not I wanted to see this movie. Like Les Miserables, I believed it could only be horrendous or excellent. Yet, in the end, I went--on opening day, no less. I've been mulling around for the past 2 days what I thought of it and I think I can now relate my thoughts in a somewhat coherent fashion. First of all, Leonardo DiCaprio was not horrendous--in fact, he was good. I'm not a fan of his and have always found him to be an immensely overrated actor so this is a big thing for me to say. However, I did not find him remarkable. And any number of young Hollywood actors could have played Gatsby as well as DiCaprio. If they had wanted "remarkable" they would have had to build a time machine, go back about a decade, and get an early-30's Matt Damon to play the role. I think DiCaprio benefited from the fact that the responsibility for really carrying this movie falls not on the actor playing Gatsby, but on the actor playing Nick and, fortunately, Tobey Maguire was mostly up to the task. Luhrmann decides to set the story through Nick, after the fact, now a "mobid alchoholic" and recovering in a sanitarium. As part of his recovery, he writes of his experiences with Gatsby, Daisy, Tom and the bunch. I found that whole thing to be a terrible and unnecessary convention. And, really, it was in these sanitorium scenes that Maguire struggled. However, if you look at what really came from the book, Maguire is the perfect choice for Nick. Carey Mulligan as Daisy was another smart choice. I will, say, though that her Daisy was a little soft for me, although I blame the direction rather than her acting for this. F. Scott Fitzgerald's iconic description of Daisy (and Tom), which is quoted in the movie, "They were careless people, Tom and Daisy--they smashed up things and creatures and then retreated back into their money or their vast carelessness, or whatever it was that kept them together, and let other people clean up they mess they had made..." just doesn't ring true for Mulligan's Daisy and I think it was because Luhrmann was trying to push the romance a bit too far (which wasn't successful, but I'll get to that in a moment). The rest of the casting was mostly spot on, although I did not think Isla Fisher was the best choice for Myrtle. Myrtle is supposed to be a hard, not exactly attractive woman and Isla Fisher is just too delicate and lovely for the role. Joel Edgerton, however, is a magnificent Tom and probably the truest incarnation of one of Fitzgerald's characters. So, on our way to the theater (which is a whole 3 minutes from our house), I was complaining about why anyone would make this in 3-D. After all, there should not have been any aliens, explosions, superheroes, car chases or icebergs. And, of course, it just so happened that we ended up at a 3-D showing. Well, I had to eat my words. If nothing else, this film shows how live-action 3-D cinematography should be done. It is used to create an atmosphere and to add to the story and, frankly, I can't even imagine what this movie would be like in flat-form! It is one of the most visually pleasing movies I've seen in quite a while. But, back to the movie itself. I've talked about the acting which, for the most part, was quite good. However, the directing left me a little cold. First of all, it almost felt like Luhrmann really wanted to make a movie musical (which, ironically, I would have been more apt to see. I've always thought The Great Gatsby would be a great musical. Too bad that we'll never see Tom and Julia's version....). There would be moments when it felt that the movie was building up to what should have been a big musical number....and then nothing. Of course, much has been said about Jay-Z's music in this and, frankly, I hardly noticed it. I think it was just lost--or maybe it just all fit in--with the visuals of the movie. Frankly, the direction just felt very heavy-handed throughout the movie. Trust me, you absolutely CANNOT miss any little iota of symbolism in this movie. Not only does Luhrmann include every single thing your high school literature teacher pointed out, but he does it front and center and in 3-D! Luhrmann really, really wants you to be an expert on every aspect of The Great Gatsby by the time you walk out of the theater. Ironically, in all this, Luhrmann misses the most important part. This movie is no longer about American identity or disillusionment born of hedonism. No, he pushes a grand romance. Strangely, though, that romance ends up being not between Gatsby and Daisy (which is what he tries to push), but rather between Nick and Gatsby. If I had to give a one sentence review of this movie it would be this: far more bromance than romance. Here is the thing about this movie, it just didn't really feel like The Great Gatsby to me. Yes, the actions of the movie stayed close to the actions of the book, but there was just something missing. Would I recommend this movie to other people? That is a tricky question. There are a number of good things about this--the cinematography, the use of 3-D, the acting but is that enough? 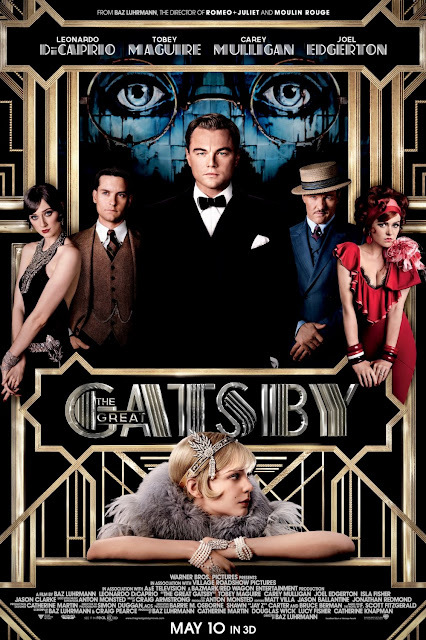 I would not recommend this movie to someone who has not read The Great Gatsby because I really, really would not want this film to be The Great Gatsby for them. For those who have read the book (which, really, who hasn't read this book? Last I checked, everyone was required to read it in high school), then maybe I would recommend it--with the caveat that it may not be as satisfying as it could be. I've never read the book, and I would like to read it before I see the movie. I am usually disappointed by movies based on books, so I understand your debate about whether to go see it or not! I would definitely read the book first! It's such a great work and, even if it ends you are a bit disappointed in the movie, you will still have had the experience of reading the book! I'm obsessed with the book. LOVED it. So, I will definitely see the movie. Although, I may choose to not re-read the book (for the umpteenth time) until after I watch the movie. Good review! I tried to re-read the book before I saw it, but I had some other books I had to get done in time for my reviews, so I only got about halfway through it. I am planning to finish it after I finish these other books, though. I re-read the book recently so that it's fresh in my mind when I do see the film. I'd love to hear what you thought of it! I understand about skipping my review...but I did want to pass this on....SEE IT IN 3D! It is totally worth the extra money! Every review I read of this admitted to it being overly flashy, given the source material. However, that said, I am a bit of a Baz fan (sans "Romeo + Juliet"), so that might be enough to make me stick it out. Also, Amitabh Bacchan...because he's awesome. Wonderful write-up, but I'm still not completely detracted from seeing it. I'm not overly attached to the source material. (Fell asleep during a reading of it once.) That and I want to see Amitabh Bacchan in an American role. Plus, I'm a bit of a closet Baz fan...except for Romeo+Juliet. Ick, I hated that. Leo is no Robert Redford, but I am excited to see this version as well!